You may not think of long-distance hiking when you think of Southeastern Massachusetts, but here at Wildlands Trust we have a unique opportunity to showcase the potential for such an adventure. Two major factors make longer treks possible in our area: connectivity of protected lands across Plymouth County that weave a trail-studded landscape and “Trail Guy” Malcolm MacGregor who maps and hikes these long-distance routes. 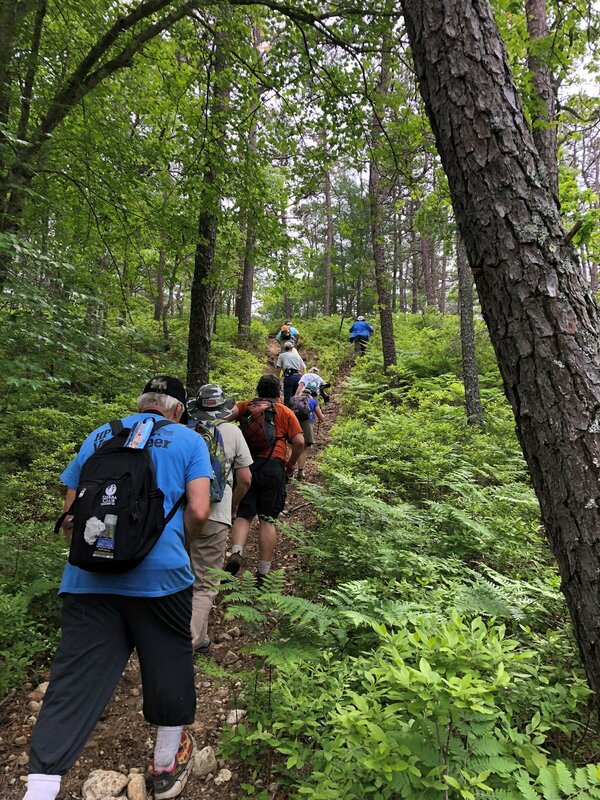 This year, Wildlands hosted our second annual “Big Ramble”, a two-part hike of 20+ miles. Last June, we traversed a 22-mile hike from the Plymouth Town Forest to Maple Springs Wildlife Management Area in Wareham. This year, Malcolm led us through 23 miles of trails in Plymouth from the top of the geographic Pine Hills to Abner Pond in the Myles Standish State Forest. On a beautiful spring day with temperatures peaking in the mid 60s, 11 hikers and three Wildlands Trust staff members set forth from the Cleft Rock parking area atop the geographic Pine Hills for a 12-mile trek to the Davis-Douglas Farm (DDF), Wildlands Trust's headquarters on Long Pond Rd. While it is “all downhill from here” at the top of route 3A, we were in for a series of ups and downs as we got closer to DDF. First, we traversed the trails atop the Pine Hills, hitting the highest point in Plymouth and the second highest point on the eastern coastline. From there, we descended into the Town of Plymouth’s newly acquired “Tidmarsh West” conservation area off Beaver Dam Road, then across the road into Mass Audubon’s newest preserve, Tidmarsh Wildlife Sanctuary. These two large tracts of land are important links for cross-town treks, not to mention one of the biggest ecological restoration projects in Massachusetts’ history. From Tidmarsh, a quick jaunt through a subdivision brought us onto the trails at the Town of Plymouth’s Beaver Dam Conservation Area, a wooded preserve along the shores of Little Island and Great Island Ponds, and lead us to Old Sandwich Road. About 8 miles in at this point, the hills begin. Steep inclines and declines characterize the next 2-3 miles, bringing us to Ship Pond Road, over Route 3 and onto the trails of Wildlands Trust’s Emery Preserve. The last mile was leisurely as an exhausted group finally arrived at Davis-Douglas Farm and gave thanks for the perfect weather and company. Mother Nature was not so forgiving on this day, one of the last of spring and one of the first to break 80 degrees. 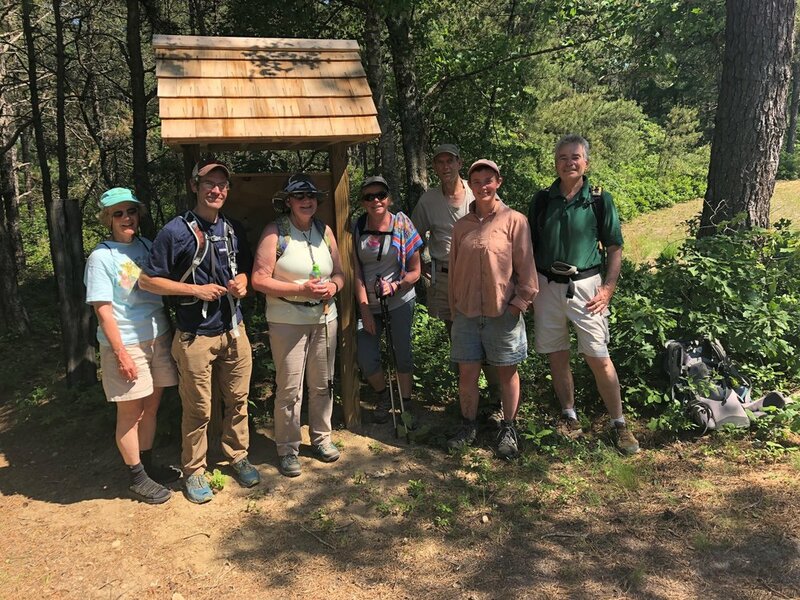 A smaller group hit the trails this time, 5 hikers and 3 staff, for the final 11 miles starting at Davis-Douglas Farm and ending at Abner Pond at Camp Cachalot in Myles Standish State Forest. From DDF, the group started with an easy walk on some neighborhood roads to get to Halfway Pond Conservation Area, 400+ acres owned and managed by Wildlands Trust. Hiking up the trails at Gallows Pond, across Mast Road and halfway around Gramp’s Loop, a sudden left brought us into Myles Standish State Forest. From here on, we were immersed in true pine barrens, a plant community characterized by gnarly pitch pine and scrub oak that offered little shade for the next 7-8 miles. 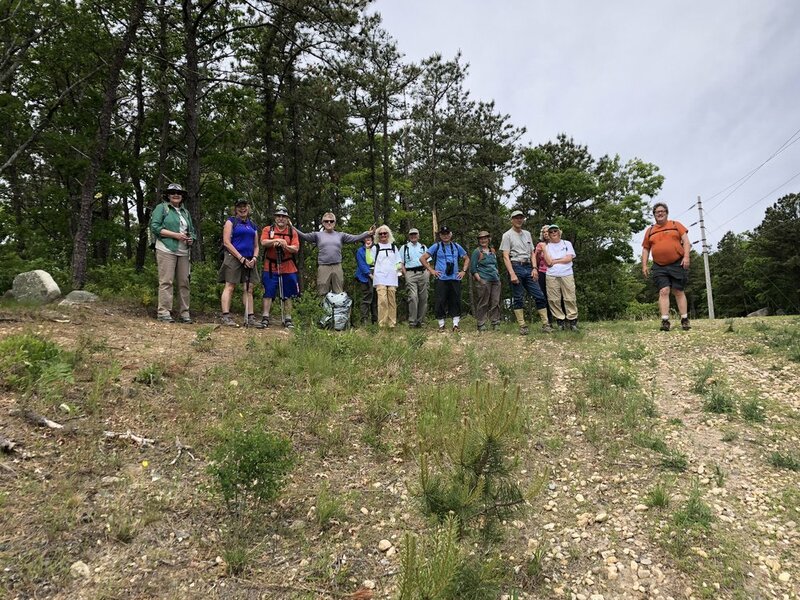 Hiking through a breathtaking landscape of historical significance, the group made their way south through the pine barrens, around pond shores, along open cutter fields and onto the Mass. Division of Fish and Game lands at Camp Cachalot. At the end of these hot, tiresome 11 miles, Malcolm was ready to turn around and hike back. The rest of us found relief in the air-conditioned environments of our cars as we drove off, tired but accomplished, looking forward to a summer of adventure on the trails. The Day Two Crew at the end of 11 miles for the day and 23 miles overall. Trail Guy Malcolm MacGregor is on the far right. Without Malcolm’s interest and expertise in trail mapping and navigation, and his willingness to lead these hikes for us at Wildlands, organizing the Big Ramble would be challenging at best. We are thankful for his unparalleled volunteerism with Wildlands Trust. Malcolm leads shorter hikes for Wildlands on a monthly basis, so check out our events page to join the Trail Guy on his next adventure! Looking to join Wildlands on a long hike this year? Mark your calendars for October 13 when OkTRAILberfest returns for a day of hiking, music and festival fun at Davis-Douglas Farm. Tickets go on sale late summer at wildlandstrust.org!